It’s hard to put the finger on an accurate description to the sounds of Holism Gaea, and I get this impression even by looking on the album cover alone. As the track titles give hints about each individual track, in the shape of a word I can understand, each track holds another obscure and less understandable word as well. 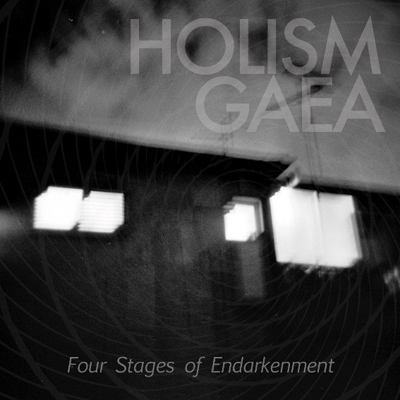 This dualism also exists in the music; Holism Gaea introduces a wonderful blend of touching tunes, brilliant sonic landscapes and harsher, shaper pulses, while mixing recognizable sounds and patterns with more sophisticated, bizarre and alien parts. Together, these elements create a hypnotizing combination of warm music and detached environment, a contradiction similar to that we can find in each track title. “Arahant Pilgrimage”, taking most of the albums time length, is a great example for this duality, as it evolve from simple, warm melodies into harsher, alienated drones, serving as background, eventually, to a great singing/chanting part, which reminds of the Legendary Pink Dots, but not in an artificial way. Holism Gaea drifts through different chapters of this opus, and shifts from abstract moments into formalistic ones. It’s a dreamy world, where this project roams, and it offers a twisted, eventful trip until it finally reaches its conclusion. Going backwards, “Ruthless Anagami” is, well, more ruthless, as it dwells on more aggressive and alien beats and vocals. It’s much more rhythmic and cast into a recognizable shape of a song, and as it moves forward it forms a psychedelic storm around it. I am not sure if this is because of this or because of the powerful beginning, but this acidic song is my favorite in this album. ‘Four Stages of Endarkment” is a D.I.Y album, delivered inside a remarkable packaging that consists of a brown paper bag, two pictures and a Cardboard title. It is well worth the time and promises impressive musical stories to those who can find it. Try it.